Curator Emma Mawdsley talks abut the war poster artist Abram Games; saxophonist Jess Gillam plays live; author Tayari Jones on her new novel, An American Marriage. 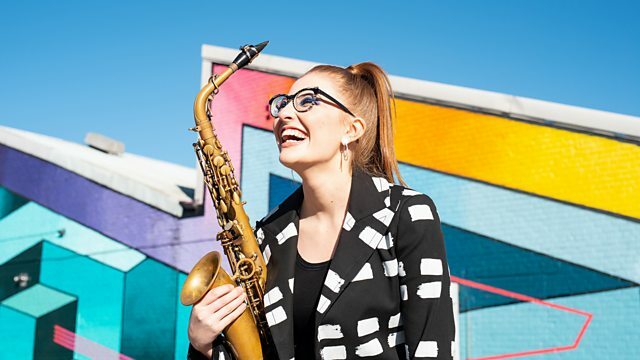 The saxophonist Jess Gillam was a finalist in the BBC Young Musician award in 2016 and went on to take the Last Night of the Proms by storm last year. She plays live in the studio and talks to Samira about her beginnings in a carnival band in Cumbria and how she wants to expand the repertoire for sax players in classical music. The influential graphic designer Abram Games, who created The Festival of Britain 1951 poster and the BBC’s first television logo, first came to prominence as the 'Official War Poster Artist' during the Second World War. Over 100 of the posters he created while employed by the War Office are on display at new exhibition at the National Army Museum in London. Curator Emma Mawdsley discusses the significance of the artist and his work. Tayari Jones’s novel, An American Marriage, tells the story of a young African-American couple whose lives are torn apart when the husband is imprisoned for a crime he didn’t commit. Tayari Jones discusses the inspiration for her the book which has been championed by Oprah and picked by Barack Obama as one of his favourite summer reads of 2018. Jess Gillam's debut album Rise is released on 26th April on Decca Classics. An American Marriage by Tayari Jones is published by Oneworld. The art of persuasion: Wartime posters by Abram Games, curated by Emma Mawdsley, is at the National Army Museum until 24th November 2019.